In 2017, the regime announced that it would action UTC to recover over US$1 million in taxes. This did not happen. And since May 2017, the regime has been playing another bizarre game – the state has twice raised UTC rental fees to extreme levels. On May 11, 2017, UTC rental price per square metre was raised from US$15.00 to US$40.00. 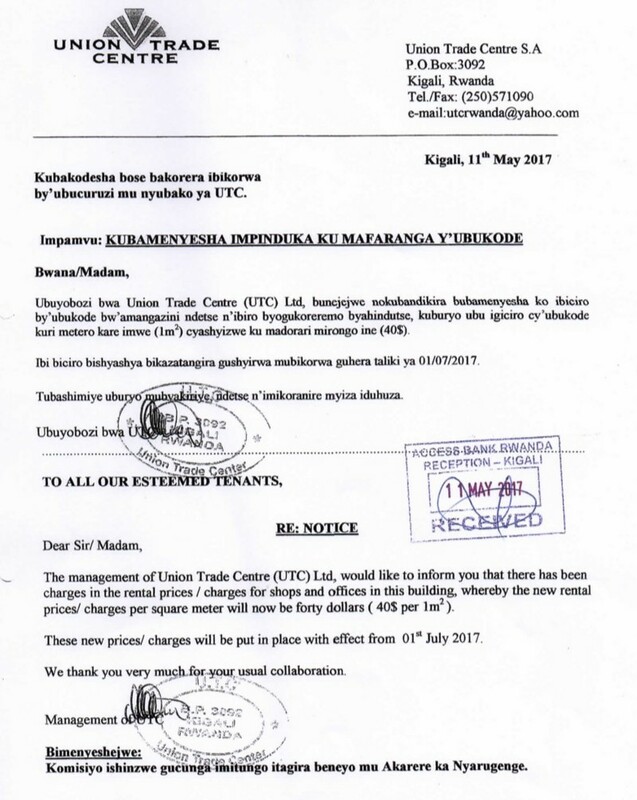 Six days later, on May 17, 2017, the regime yet again raised UTC rental fees from US$40.00 to US$60.00. 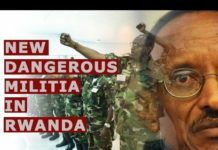 The question we must ask is this: What does Kagame hope to achieve with these strange tactics? A rental fee of US$60.00 per square metre is exceedingly high – not even in costly cities such as Sandton in Johannesburg, would a square metre cost US$60.00. 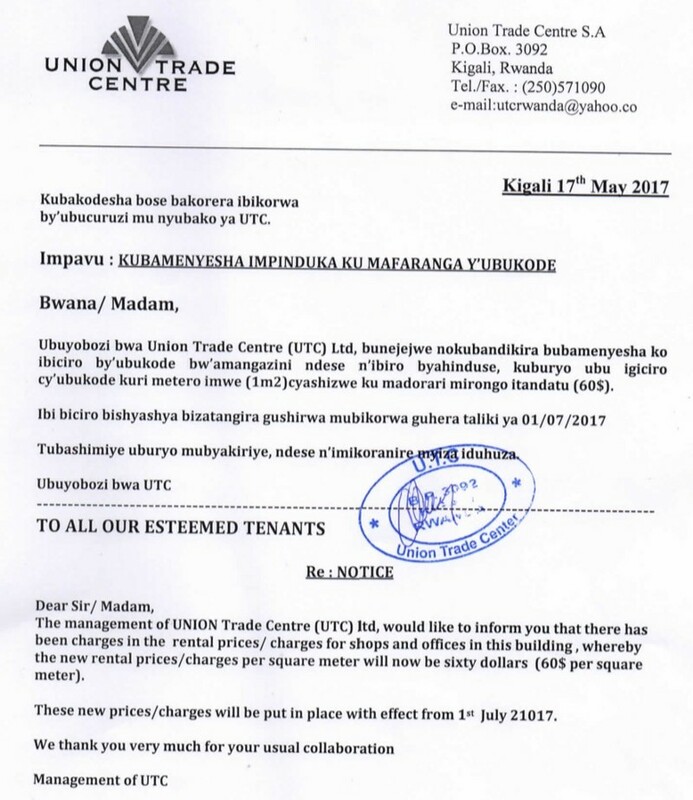 Clearly, Kagame and his regime are determined to drive out all tenants from UTC by making it unaffordable. But then what? This is a shopping mall that earns US$120,000.00 per month. If Kagame drives out all the tenants, what will he do with the empty shopping mall? There are several possibilities, based on what we have recently observed in Kagame’s Rwanda. Kagame could demolish UTC as he did Rwigara’s hotel in 2016, and Tower Hotel in 2017; he claimed that the two structures did not meet his standards. Kagame could auction the emptied UCT more cheaply after degrading it. Without prejudice to other legal provisions, abandoned property shall be managed by the State represented by the Ministry until the owners show up. It therefore follows that whoever buys UTC if auctioned, or purchases the land on which it stands, if demolished, digs himself or herself into a US$20 million debt plus interest and costs. In either case, the real owner will remain the principal shareholder who is Tribert Rujugiro Ayabatwa. Try as he may, Kagame cannot change this reality. And of course he won’t live forever. It is a matter of when – not if –that UTC reverts to its original owners. A Rwanda Court Freed The Rwigaras. Was This A Sign Of Judicial Independence Or Kagame’s Political Scheming?